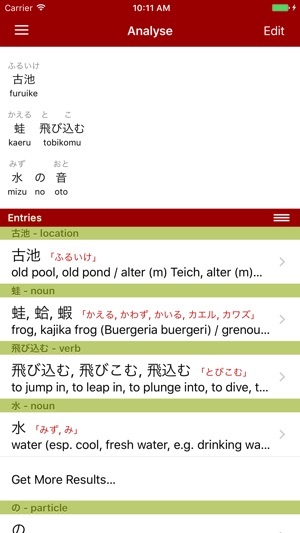 This application is a multilingual Japanese dictionary that does not require an internet connection. Imiwa? was created using the amazing JMdict files from the Electronic Dictionary Research and Development Group based on the work of Jim Breen on the EDICT project. 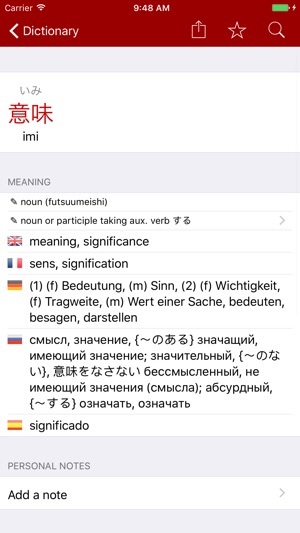 While some definitions are available in 4 languages (English, French, Russian and German), only the English translation is guaranteed for all entries in the JMDict dictionary. Initiate a search in any of those 4 languages, in Japanese or in romaji and imiwa? will do the rest. imiwa? Also includes a rich database of kanji (KanjiDic), examples (from tatoeba.org) and conjugations as well as tools suitable for beginners. 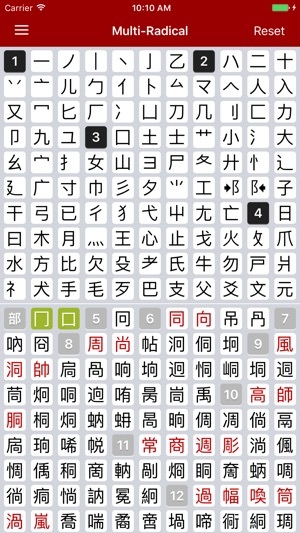 Use the Traditional Chinese character recognition keyboard included in the iOS system for drawing kanji on screen. Definitely my #1 go to Japanese dictionary. Great to know it's now IOS 11 compatible. Fantastic interface and usability as always. This is amazingly useful for students of the Japanese language! 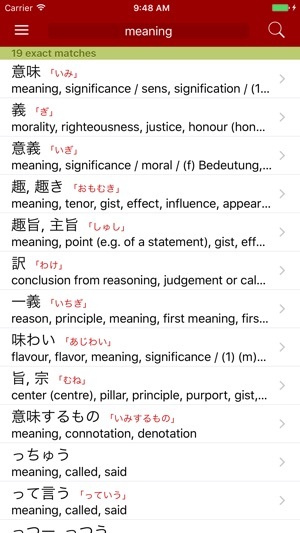 I use it when I'm doing my Japanese assignments, when I'm in Japanese class, when I come across words pretty much anytime I see them. The ease of use is just INCREDIBLE. Why buy an electronic dictionary when you can get this for free? In fact, I have an electronic dictionary for English-Japanese translation, but Kotoba! well surpasses them in terms of ease of use, not to mention load times. Even my native Japanese teachers were pretty impressed with it. I would include what they said, but it seems like they don't support Japanese characters here, and I don't feel like putting it in Romaji. So oh well. And now that the latest version of Kotoba! 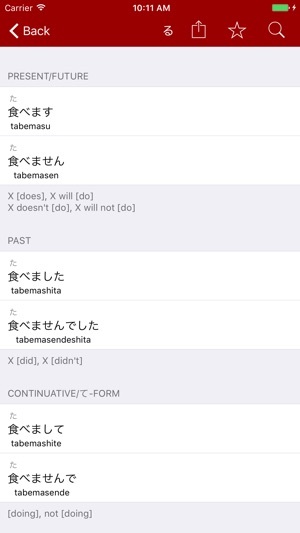 has implemented help with conjugation, it's of even more use than before! No more wondering how to conjugate adjectives because you're unsure if they're i- or na-adjectives, and so on! One of the main reasons why I bought an iPhone. Cuts the time I spend on shukudai by half. Makes my Nintendo DS electronic dictionary look vastly overpriced by comparison. Makes paper dictionaries look like stone age. Wondering about that particular word on the way to class? Just whip this out, and check it while you travel. Wondering how to form that particular sentence to say to your sensei? Again, the examples in the dictionary are a massive help. Easy to use - do activate your Traditional Chinese keyboard so that you can draw/write kanji - Kotoba recognizes my writing flawlessly. Otherwise, type in English or Romaji - all works fine.